“Unless I see the mark of the nails in his hands, and put my finger in the mark of the nails and my hand in his side, I will not believe.” That one sentence has left Thomas forever labeled Doubting Thomas. That’s the Thomas with whom we are most familiar. Maybe, however, there’s another side to Thomas, a twin, that we often overlook. That’s the Thomas that wants to believe. That’s the Thomas Jesus comes to in today’s gospel. This is a story about believing, not doubting. If it tells us anything it tells us that resurrection is difficult to accept, to believe. It’s not just an idea or a fact to which we give agreement or assent. It is a whole new way of being. If we’re not wrestling with what resurrection means, it’s place in our life, and how it manifests itself then maybe it’s just not that real for us. Thomas may be the one that gets labeled but the other disciples also reveal the difficulty of believing. On the evening of the first day of the week, the day Jesus was resurrected, they are hiding. God opened the tomb and they locked the doors. God emptied the tomb and they filled the house. Jesus appears to them in their locked room. He speaks to them. He breathes life into them. A week later they are in the same place, behind the same locked doors. Not much has changed. Despite how we’ve labeled him Thomas is not doubting. He is struggling with how to believe and what to believe in. He wants to see and touch for only one reason. So that he too might believe. There’s something faithful and authentic about that. It’s a struggle most of us probably know. What do you want to believe about Jesus’ resurrection? What gets in the way? What makes it difficult to believe? How are you wrestling and struggling with the resurrection of Jesus in your life? I want to believe that Jesus’ resurrection offers peace but I see wars across the world, families in conflict, and relationships broken. I want to believe that Jesus’ resurrection overcomes death but I still cry for and feel the absence and loss of our son, Brandon. I want to believe that Jesus’ resurrection is real but I don’t see much difference between my life this week compared to the week before Easter. Most of you can probably make similar statements about how your “belief” doesn’t really fit with what you see and experience. We can quickly and easily get to the same place as Thomas. I know I can. Unless I see wars cease, conflict resolved, and relationships reconciled, I will not believe. Unless I feel Brandon’s presence, the tears dry up, and the pain goes away, I will not believe. Unless I experience some measurable difference in my life, I will not believe. We’re not all that different from Thomas. We each live with at least one “unless clause.” Unless I see, unless I touch, unless I feel, unless I experience, I will not believe. It reveals our struggle and desire to believe. It also reveals our misunderstanding of faith and the resurrection. Far too often we condition the resurrection not on the power of God but on the sufficiency of the evidence. Each condition becomes just another lock on the door. It won’t keep Jesus out but it will keep us trapped inside and it won’t be long before our house becomes our tomb. The resurrection of Christ does not meet our conditions. It empowers and enables us to meet our conditions. It lets us unlock the doors and step outside even when we don’t know what is on the other side. The resurrection does not end wars. It reveals the sanctity and dignity of life so that we might speak and work “for justice, freedom, and peace.” It is the compassion behind the tears we weep and the prayers we offer for all who are “victims of hunger, fear, injustice, and oppression.” The resurrection does not magically fix relationships. It is the energy and perseverance behind our work to reconcile relationships and resolve conflict. It is the power by which we love our neighbor as ourselves. The resurrection does not eliminate our pain or tears over the death of a loved one. It is the “strength to meet the days to come with steadfastness and patience; not sorrowing as those without hope but in thankful remembrance of [God’s] great goodness, and in the joyful expectation of eternal life with those we love.” The resurrection does not offer measurable results, productivity, or efficiency. It guarantees our life and our future with God. I don’t know if Thomas put his finger in the mark of the nails or his hand in Jesus’ side. St. John doesn’t say and for good reason. It doesn’t really matter what Thomas did. That’s not the issue. This story isn’t about Thomas. It’s about us. How will we live? What will we do? Have we come to believe? 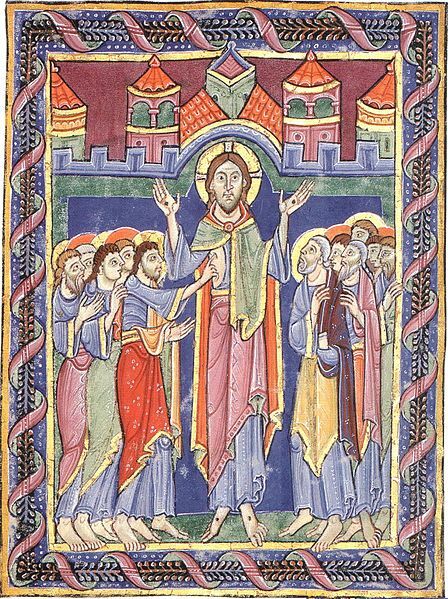 This sermon is for the Second Sunday of Easter, sometimes called Thomas Sunday, and is based on John 20:19-31. Beautiful post here which turns what we have heard as a story about doubting on its head…full of thought provoking inspiration which brings the Resurrection into everyday life situations. Love this post, have reblogged. Full of thought provoking reminders brought into our everyday lives. Stphanie, thanks for reblogging this post and for your encouraging words. I hope you are well and the “eastering” of our Lord in your life is abundant. As happens so often, Fr. Mike, you have left me without words, except to say thank you, thank you, thank you. Ellen, you are most welcome. I hope the sermon was helpful and that Christ is “eastering” within you. Thanks so much for this awesome and very moving message. It is were we are in our struggle and will help us move forward. Thank you in The Lord Feel like all the Easter sermons hit home for us. Love you and Cyndy. Great sermon, as usual. Your posts are always welcome in my inbox. Thank you, Robin. I appreciate your kind words. Thank you Jennifer. You words are encouraging and very much appreciated.